Queens, NY New energy efficient Crystal windows and doors provide views for apartments at the newly constructed Allura Waterfront Resort. Crystal Window & Door Systems provided 842 windows and sliding and swing terrace doors for the new development at 109-09 15th Ave. in College Point. The six-story Allura building with 134 apartments has floor-to-ceiling glass and metal panel façades on multiple sides of the building, offering occupants great views of the waterfront and LaGuardia Airport across Flushing Bay. The Allura complex is U-shaped, with two parallel wings that protrude towards the water, and most of the units have full-length glass railed balconies. Crystal windows and doors were combined in horizontally ganged and vertically stacked configurations to provide most of the apartments’ floor-to-ceiling glass façade elements. The majority of the window products supplied were the Crystal architectural Series 8500 Aluminum Outswing Casement and Series 8510 Aluminum Fixed Picture windows. Over 700 of these windows were used, predominantly in 2, 4, or 6-window configurations in sizes up to 84” wide by 96” tall. In some instances, operating casements and fixed sashes were combined in dual panel master frames. The Crystal Series 8500 Casement with 2-1/2” frame has an outstanding AW-PG100 rating, dual-arm operator, and double row bulb weatherstripping. For this project, the casements were specified with a beautiful satin chrome operating handle and 4” sash opening limit devices. The Crystal Series 8510 Fixed Picture also has a 2-1/2” frame depth and is AW-PG85 rated. 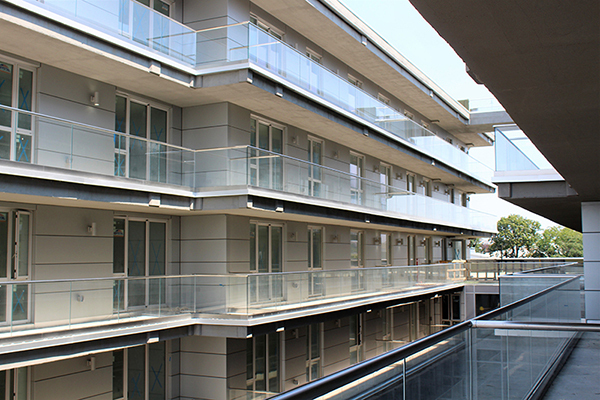 To provide building residents access to the extensive balconies, over 120 heavy-commercial Crystal Series 1280 Aluminum Sliding Patio Doors were installed. The 2-panel sliding doors were fabricated in large sizes up to 72” wide by 96” tall. In some instances, the Series 1280 doors were combined with two sidelight windows to span floor-to-ceiling openings 96” wide by 96” tall. The Series 1280 has a strong frame depth of 4-9⁄16”, an AAMA AW-PG50 rating, adjustable dual-tandem, stainless steel ball bearing rollers, and a heavy-duty latch handle. Additional access to the balconies in the larger apartments was provided by 22 of the Crystal Series 1450 Aluminum Swing Terrace Door. Specified at 36” wide by 96” tall, these Crystal floor-to-ceiling products continued the building’s use of impressive glass façade elements. The Series 1450 has a frame depth of 3-¼”, an advanced insulated strut thermal break system and is AW-PG75 rated. The door has a multi-point lock system and an opening limit bar for added safety and security, especially important with a wind-gust prone waterfront exposure. All the Crystal window products feature 1” insulated glass units (IGUs) with Vitro 3⁄16” Solarban 60 low-E glass and argon gas filling. Tempered glass was used where required by code or otherwise appropriate. The Crystal combination window and door systems used 3-piece and other mullion systems to gang and stack the units. Setting and anchoring the window systems in place was facilitated with a variety of Crystal installation accessories including head and jamb receptors, subsills, sill pan flashing, snap trim with clips, L and F shape clips, and other anchoring components. Most of the Crystal windows, doors, and exposed mullion and anchoring accessories were finished with a durable AAMA 2604 rated Simulated Anodized Silver powder coat paint. Windows installed in the building’s brick façades, which face the adjoining streets, were finished in AAMA 2604 Bronze color powder coat paint. Waterfront Resort, Inc. of Corona, NY, is the owner of the Allura condo development. Lam & Lam Design, also of Corona, is the project architect and engineer. The general contractor is King’s Construction USA Group, Corona, and the fenestration installer is Marvel Contracting of Oakland Gardens, Queens. 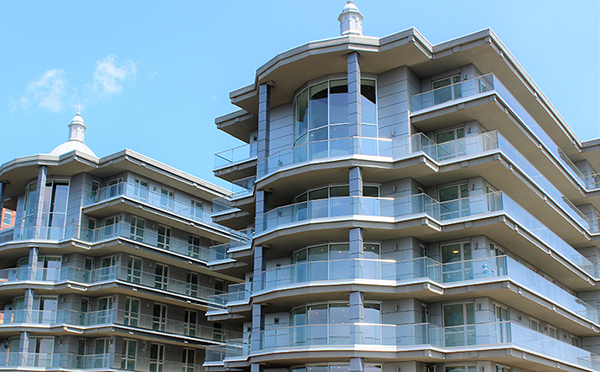 Gamco Corporation of Flushing, NY, supplied the extensive balcony glass railing systems. The 180,000 s/f building includes 134 apartments in 1, 2, and 3-bedroom layouts, underground parking, and will have 70 boat slips when the marina area is completed. A fitness center, spa, pool, and sundeck add to the resort atmosphere. A spacious, attended lobby welcomes residents and first floor conference room and business center are available for events. The Allura Waterfront Resort has been nominated for several local area building awards, in part due to the complexity and challenge of the project site, which required extensive pilings and bulwarks for stability of the site prior to construction of the foundation and building.